Manufacturer of Puddled and Charcoal Wire Rods, Boiler Plates etc. Registered Trade Mark - HS Snedshill. 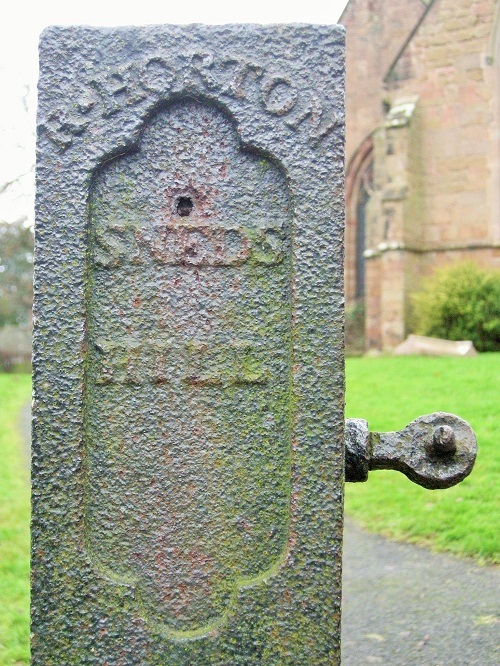 A gatepost in the churchyard of St Andrew's church in Shifnal (see photo) was made by 'R. Horton Sneds Hill'. It is evidently of great age. Was Horton's foundry the forerunner of the Snedshill Iron Co? c.1793-4 William Wilkinson sold the Snedshill ironworks to John Bishton the elder, John Onions, and others. 1807 The Snedshill ironworks, of which at least one furnace was managed by John Horton, was brought into the Lilleshall Co. under a new partnership agreement. c.1825 After the construction of the Old Lodge furnaces at Lilleshall, production at the Snedshill furnaces declined. Early 1830s: A forge was built on the site to make wrought iron under the partnership of Horton, Simms, and Bull, which had close links with the Lilleshall Co. and used its pig iron. 1838 William Simms and R. Horton were the proprietors of the 'extensive ironworks at Snedshill'. Last week we gave an account of a boiler explosion, at the Snedshill Iron Works, belonging to Messrs. Horton, Simms, and Bull, when we stated that one young man was killed ; we regret to state that another, a boy named Walter Marrion, also died the following day ; and a third person, named Daniel Williams, labourer, forty-five years of age, is so ill that his life is despaired of.' [continues with a report of the Coroner's Inquest]. 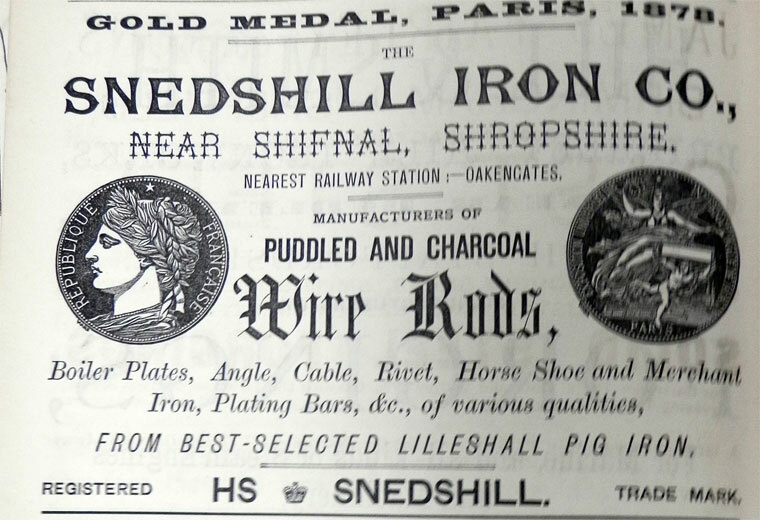 1854 Samuel Horton became sole owner of the Snedshill firm, which he took into the Lilleshall Co. in 1855 when a new Snedshill Bar Iron Co. was founded. The firm rapidly became established as one of the country's leading wrought iron makers, its products including bar, flat, cable, rivet, and horseshoe iron, boiler plates, sheets, wire rods, and structural sections. It had 35 puddling furnaces, plus about 8 charcoal hearths to produce the charcoal iron demanded by conservative customers. 1878 'EARL GRANVILLE THE LARGEST IRONMASTER IN ENGLAND. Earl Granville takes a deep interest in all that relates to the trade, and is well and constantly advised of the various changes, commercially and otherwise, that are continually taking place. His lordship has extensive ironworks in Shropshire and North Staffordshire. There are in the former county four blast-furnaces at Priorslee constantly occupied in making best grey forge-iron, which is mostly consumed by his own works at Snedshill and the leading Staffordshire firms. There is a group of five furnaces at the Lodge in Shropshire making cold-blast iron, which supplies Snedshill, his lordship's own Phoenix engine-shop, Staffordshire, Sheffield, and Leeds with this marvellously superior iron. Wherever strength is required in casting, such as engine-beams or cannon, the cold-blast is invariably used as a mixture at every noted engine-shop in this and other countries ; for strength this iron is a sine qua non as a mixture. It is also absolutely necessary for chilled rolls and all kinds of chilled work, and is particularly adapted to the great chilled rollers which constitute the heavy crushing machinery of powder-mills at these national manufactories in different parts of the world. In Shropshire also is his lordship's Phoenix Foundry, a large and well-equipped establishment, where locomotives (colliery,) steam-engines of all classes and sizes, steam hammers, presses, with all and every kind of heavy machinery is turned out to perfection. His lordship is also the principal partner of the Snedshill Ironworks, in the same county, where the best boiler-plates are made, " Snedshill" brand for this class being unrivalled in quality. These works have 39 puddling furnaces, extensive wire-mills, gobbing fires, and all the appliances for making best charcoal iron. His lordship's partners here are Mr. T. Horton, Mr. Samuel Horton, Mr. Bullock, and another. On the Lilleshall Estate the coal and ironstone are more abundant than in any other in Shropshire; a hospital is established for the workmen schools and a church have been erected by the noble proprietor and his co-partners; and, to the honour of the company, great facilities are afforded the workmen in cheap cottages with gardens about the estate. The workmen are happy and contented, and we never hear of strikes, and rarely of disagreements, with the employers and the men of this great Estate. In North Staffordshire his lordship has eight blast furnaces, formerly at Shelton; but believe now the whole of these great smelting-works are being reconstructed at Etruria, which is contiguous. Near the same spot is the Shelton Bar Ironworks, one of the largest in Staffordshire, where plates, bars, angles, tees, and channel iron of the largest dimensions are made. This work has 95 puddling furnaces, with a very large and valuable stock of rolls adapted to all specialities in tees, angles, channel iron, &c., &c.